Level up your entertainment with the Samsung Galaxy Tab S2 which features 9.7 inch super AMOLED display and give your pictures a new life with rich colors and extra brightness, and render gleaming and sharp details with a dynamic 2048 x 1536 resolution which visualize you high-quality and lifelike images. 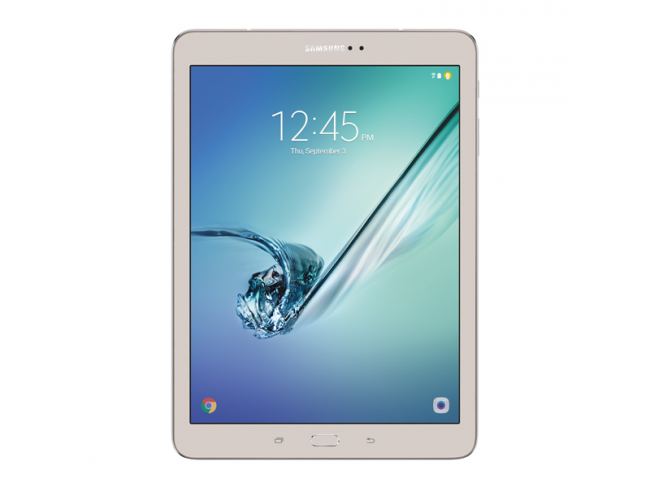 The Samsung Galaxy Tab S2 has embedded with a stupendous 32 GB expandable memory and a MicroSD card support up to 128 GB, helps you to store your loving videos, music files, games and e-books or whatever you want just pour them in your device without any hesitation and an enormous 3 GB of Super fast RAM, enables you to swap like a spark and renders high-quality video streaming. The 9.7 inch Galaxy Tab S2 has deployed with a 21 MP flagship camera which features 4 x digital zoom and offer High-Definition image quality and makes you able to shoot superb photos with extra brightness and colors, with this flagship camera you can make Quad HD videos at the dynamic resolution of 2560×1440 @30fps, further it is equipped with a gorgeous 8 MP front camera with which you can take sharp selfies. The Tab S2 has powered by the latest operating software of Android OS v6.0 Marshmallow renders you a faster swap between apps and it is rigged with the most modern Octa-Core (1.8GHz Quad + 1.4GHz Quad) processor and integrated with APQ8076 chipset. A powerful 5,870mAh Li-Ion battery is packed with up to 12 hours video, 8 hours internet and up to 109 hours of music playback timing and available in Gold color in just $399.99 only.